For the final installment of 2014's October Movie Roll Call, I've decided to go with a time-honored Halloween theme: witches, or if you prefer, witchcraft (the practice of, or the belief in, magical skills and abilities). This is not the tales of boy wizards (which I love), but the long tradition of "Double, double toil and trouble" witches. 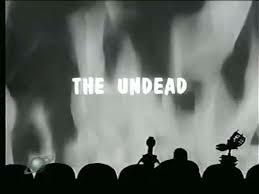 First up, Mystery Science Theater 3000's take on Roger Corman's The Undead (1957, aired on MST3K on March 8, 1997). No, despite the title of this "film" it is not about zombies, but witches, time travel, and past lives. Confused? That is a common problem with The Undead. The full synopsis is this: Quintus Ratcliff, (Val Dufour), profession really not clear, hypnotizes a woman named Diana (Pamela Duncan) to touch on her past lives. The powers he learns in Tibet are more than he realizes as he sends her subconscious back in time and the first thing Elaine does is to help one of her past lives, Helene (also played by Duncan), escape from prison, where she is due to be executed in a day's time for being a witch. This alteration has the potential to complicate and erased all further lives of Helene, including Diana. Therefore, Quintis goes back in time to, not really convince Helene that she must die, but to see how things actually play out. Though Helene is not a witch, there are witches, Helene's true love, an imp, and other strange characters including Satan (who is really out to get Quintis for meddling with time). I think Mike Nelson says it best: "I've never known more about what isn't going on in a movie" - but hey, at least Mike, Crow, and Servo make it fun! There are a good number of witch films to choose from - I imagine most of you have already watched or will be watching Hocus Pocus (1993) before this week is over. Personally, I wanted to take you back to another early 90s witch film, one that holds a place in my childhood: The Witches (1990). Yes, the Jim Henson Company's film adaption of Roald Dahl's The Witches (1983). Maybe it is my love of the book or maybe it's my love of Anjelica Huston, but I want to bring this back into your October movie watching rotation. The synopsis is this: Recently orphaned, Luke Eveshim (Jasen Fisher), is taken under his grandmother's Helga (Mai Zetterling) care. She tells him a story where a woman she knows was taken by a witch and forever trapped in a painting and how she herself lost a finger when she once encountered a witch. Luke shortly encounters a witch, a woman with purple eyes who tries to lure him with a snake and chocolate. Luckily - he escape, but its not the last time. For Luke's birthday, Helga (suffering ill health) takes him to stay at the Excelsior Hotel in Cornwall. This is where the story really begins. There, he befriends a boy named Bruno (Charlie Potter), gets in trouble with the hotel manger (Rowan Atkinson) and staff, and encounters a witch convention (witches can have conventions too, right?) that goes by the name "Royal Society for the Prevention of Cruelty to Children" led by Evangeline Ernst (played by Houston). 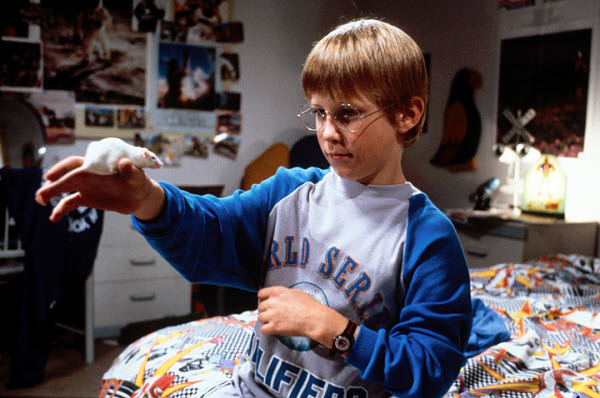 The society really wants to turn all children into mice (using sweets to lure them), including Luke, and it turns out they wear wigs, gloves, and masks to disguise their stereotypical witch forms: hideous noses, hunchbacks, scabs, etc. Luke must stop them, but of course, Luke is susceptible to "Formula 86," a magic potion which turns the drinker into a mouse. What happens next? Oh, I suggest you watch the film, or even read the delightful book. The British are the best at witch stories after all, as the boy wizard as proven to the masses.